Kime and Morse' article on Mead has long been considered one of the definitive articles on the history and technology of making mead. Delving not only into the historical aspects of our favorite drink, it also explores new (at the time) technologies, with special attention given to the process of ultrafiltration, then a new approach. Mead is simply honey wine. It is made when honey is diluted with water and/or fruit juices and allowed to ferment. Mead is thought to be the first alcoholic drink made by man and it has a long heritage of use for over 5,000 years. The reason for this is simple, honey was available in quantity and there was minimum equipment and technology needed. The first batch of mead probably occurred when it rained into someone's open pot of honey and the wild yeast did the rest. Rather than discard the bubbling mess, the unsuspecting owner may have become the first known drunk. Mead was commonly given as a gift to newlyweds to be consumed during their first month of marriage to ensure virility and child-bearing; hence the term honeymoon. Honeybees were native to Europe, Africa and the Near East. Since there was a great abundance of honey producing plants in these areas, there was an abundance of bees and thus honey for mead. Only the lack of hollow trees would have restricted bees, honey and therefore mead availability. Only when grains became cultivated and it was learned how to convert their starches to a cheaper source of sugar to make an alcoholic drink (beer), did the demise of mead begin. The ancient Greeks and Romans made little mead according to records they left behind. We know grapes thrived in the Mediterranean climates and the fermented drink from them (grape wine) was preferred to using the more valuable honey. Mead in the middle ages was popular in northern Europe and especially in Great Britain and Poland because there was a good honey supply and a lack of grapes. The traditional method of mead making has changed little in 5,000 years. The Morse-Steinkraus patent may have been the first and only major improvement in the process (1). The nutrients Morse and Steinkraus determined were needed for mead making, greatly sped up the notoriously slow and often stuck fermentation of mead. As early as 1972, Morse listed 159 references in a bibliography on honey wines (2). Much had been written, but little had changed or improved the way mead was made. Unfortunately, after all these years, no one has addressed the real problem with mead. The Morse-Steinkraus patent did state the problem: "Wine made from honey has not been particularly popular with the consuming public since the flavor usually is harsh and bitter and the wine has a poor shelf life owing to the cloudiness by precipitation." (1). It has long been known that the cloudiness in mead is caused by the protein in the honey. The protein in honey may also be one of many causes of slow and/or stuck fermentations. Recipes found from 1200 to 1700 AD, recommended boiling the honey-water mixture prior to fermentation into mead. We have never seen in writing an explanation as to why they did so or how they discovered that this boiling step was important in mead making. It is assumed that without this boiling, their mead remainded cloudy and not as appetizing. Apparently crystal clear wine was a demanded virtue even then. We now know this boiling step helps coagulate the proteins naturally found in the honey fermenting solution, giving us a better chance of a clear mead. Anyone that bottles honey is aware of the undesirable effect caused by overheating on honey's flavor. Heating honey for only a short time over 150°F, let alone boiling it, causes detrimental effects on honey flavor and color. Boiling has little effect on the honey's glucose, but the fructose is a delicate sugar that burns easily. Still, to this day, the general recommendation in nearly all books (3) and recipes is to boil the honey solution for one hour, before any fermentations are started. The foam resulting during the boil is to be skimmed. Most of the protein is in the foam. The boil step is used not only to coagulate the proteins, hopefully preventing protein hazes, but also to sterilze the prefermentation solution. A commercial meadery using this process on only 500 gallons, required 12 hours to get the honey solution boiling. After one hour of boiling, an additional 12 hours was necessary to allow the solution to cool enough for the addition of yeast. We discovered that this boiling step in the commercial method is the main cause of mead's poor taste. You wouldn't treat honey this way to eat, why do it to drink as mead? Sensory tests conducted in the Food Science Department verified that this traditional boiling process is very detrimental to the finished quality of the mead. Even using a flash one minute boil, followed by an instant cooling, causes the same detrimental effect. Panelists described the mead as having a bitter, harsh, resin-like taste (4). Traditional mead makers have been known to store mead from three to seven years, probably to mellow these faults caused by boiling. Chemical analysis of fifty commercial meads by Morse and Steinkraus (5) and Sarin (6) showed an average 16 % residual sugar level. We assume these high sugar levels were used to mask the defects caused by the boiling method. Does the past quality of mead, the extremely high residual sugar levels and the economics of a long fermentation / aging method keep the world's mead industry underdeveloped? There are thousands of grape wineries in the world, hundreds in the United States and over 110 in New York State alone. The American Mead Association (7), an organization dedicated to promoting mead and bringing together mead makers, lists less than twenty wineries in the United States and forty in the world that produce mead. Few of us could find a bottle of mead to purchase in the state we live in, let alone at a local wine store. Ultrafiltration (UF) is simply a very fine, cross-flow, continuous type filtration method. It differs from the through-flow, noncontinuious, bag and diatomacious filters used for honey, only by the smaller size waxes, pollen, mold, yeasts, bacteria and compounds, etc. that it filters out. Hundred mesh bag filtration used for honey is very coarse filtration. Diatomacious earth filtration, used for honey, fruit juices and wines, etc., can filter as fine as 2.0 microns and larger. Sterile filtration (ex.., for wine bottling) removes anything below 0.40 microns, including yeast, mold and bacteria. Ultrafiltration removes anything from 0.10 microns down to 0.01 microns – much finer than sterile filtration. Proteins may be the largest molecules in honey. Some, but not all protein in honey can be removed by ultrafiltration. Some protein may even be removed by diatomacious earth filtration. Ultrafiltration however does not remove honey flavor or color. Diatomacious earth can not physicially remove proteins, flavor or color from honey, but may do so chemically. Research in the Food Science Department discovered that ultrafiltration of the diluted honey solution @75°F removes enough of the honey's protein to cure all of the above mentioned problems of the commercial boil method (graph 2). The ultrafiltered honey solution can then be fermented to produce a high quality, economically produced mead. Taste panelists noted that the mead made using the UF method was clean and smooth. Over 90 % of the panelist gave it a "good" rating. Panelists said the mead made using the boil method was harsh, bitter, astringent and that it had a resin-like taste and only 10 % of the panelists gave it a "good" rating (8). Remarkably, our panelists' unpleasant description is exactly the same words used by Morse and Steinkraus a quarter century ago. 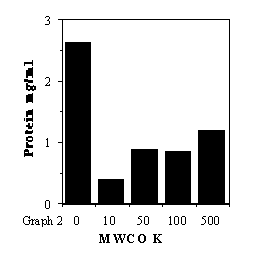 Recent fermentations were carried out on honey solutions ultrafiltered at 10K, 50K, 100K and 500K (K=thousands) molecular weight cutoffs (MWCO) or about from 0.01 to 0.10 microns. It was hoped that a strong, dark and less expensive baking type honey could be ultrafiltered to give a light mild tasting mead. As can be seen in graph 1, Hunter L readings (L 100 = white, L 0 = black) do not increase (become whiter or lighter colored) by using even the finest 10K cartridge. The honey flavor and undesirable taste in this dark honey did not decrease with ultrafiltration. There was not a significant taste preference of the meads, due to MWCO, by the panelists (graph 4). Nearly 70 % of the panelists did rate the mead "ok" or "good", surprising results considering it was made from a somewhat undesirable honey. Although the 500K cartridge only removed half the honey's protein, clarity tests of the mead showed that the 500K mead is as clear and stable as that of the 10K mead (graph 3). This suggests that other factors may be the cause of stuck and cloudy mead fermentations, notorious in non-ultrafiltered mead. There are some important questions which still need to be answered. It would be interesting to make mead from the many types of honey, as is done in making wine from the many varieties of grapes. Since the honey is cut 1:4 with water, nutrients and acids need to be added to the fermentation. Which nutrient and how much of each really makes the best mead? How much and which one or combination of malic, citric or tartaric acid makes the best mead? How much residual sweetness is needed with different levels of acidity? Does fermentation temperature affect the taste of mead? Since the UF method does not use heat, is any aging necessary? If not, we can have the mead fermented, bottled, labeled and on the shelf in less than10 days after the yeast is added. It must be remembered that fermenting temperature, yeast type, acidity, pH, nutrient types and amounts as well as alcohol levels can also greatly contribute to the fermenting rates of mead. What effect do all these factors have on taste? What character of mead would give the best overall consumer acceptance? Would most consumors prefer a harsher, astringent beer like taste (boil method mead) or a clean, light honey, grape wine character and taste (UF method mead)? Could a low alcohol, lightly carbonated mead find a consumer niche as draft hard cider and speciality honey beer has recently? Much scientific mead making, analysis and taste testing of mead needs to be done. Six new meaderies in the United States are already using the Food Science Department's ultrafiltration mead making method. Their meads have won Gold, Silver, Bronze and Best of Show awards in State, National and International wine and mead competition. These awards prove that this ultrafiltration method results in a superior mead. But can we make it even better? Does taste, or as thousands of years ago, the availability of a cheaper fermentable sugar still dictate whether we consume beer, grape wine or mead. Or can an improved mead finally cut into the huge wine and beer market? Already, 25% of the meaderies in the United States are using ultrafiltration of honey for mead production. The honey industry's support of mead research could produce an even higher quality product, enhancing the image of mead and contributing to the potential for dramatic increases in US and world honey sales.